Winter Yoga Retreat – 9:30am-6pm. Feb 1-Feb 2. Enjoy a 2-day retreat in meditation, yoga, the world of essential oils, restorative yoga, eating for a yoga body and kirtan. $225. 49 Lawton St, 2nd floor, New Rochelle. 914.632.1101. WestchesterYogaArts.com. The Stress-Less Workshop – 10am-1pm. 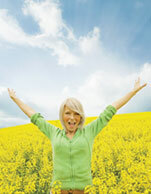 Learn how to de-stress naturally using safe, effective herbs and simple reflexology exercises. $30. Center For A Healthy You, 1984 New Hackensack Rd, Poughkeepsie. 845.592.4609. Reiki I Class – 1-5:30pm. Feb 1-Feb 2. Learn self-healing benefits of Reiki, history, ethics, and hand positions. $150 manual/certificate, Anne Bentzen, Usui/Karuna Master. Unitarian Universalist Fellowship, 236 S Bedford Rd, Mt.Kisco. 914.588.4079. StarVisionsCommunity.org. Yoga the Iyengar Way – 1:30-3pm. Feb 1-Mar 8. Explore the building blocks of Iyengar yoga: alignment of body mind/body breath/ and Self. Build from the ground up, step by step with precise instructions. $25ea or $127.50/series. 49 Lawton St, 2nd floor, New Rochelle. 914.632.1101. WestchesterYogaArts.com. Core Principles of Pilates – 12:30-2:30pm. This workshop focuses on the teachings of Joseph Pilates’ principles to properly and safely execute exercise. $25. Inner Balance Studio, 1072 Rte 311, Patterson. Preregistration required: 845.878.7800. InnerBalanceStudio.org. Groundhog Day Ecology Walk – 1pm. Join Cary Institute educators for a family friendly guided walk on the trails, open for this special event. Begin at main campus parking lot, 2801 Sharon Turnpike/Rte 44, Millbrook. Program cancelled in the event of severe weather. Register online at http://carygroundhogday.eventbrite.com. More info 845.677.7600 x121. Art Therapy on Hudson: Art Journaling Workshops – 1:30-3pm. Love Me/Love Me Not. Journaling on questions of love. $30. Register: 914.584.1820. ArtXOnHudson.com. Bi Monthly Adult Meditation Group – 7-8pm w/Merrill Black, Reiki Master. Unique theme, guided meditation, and group discussion. The Temperance Center, 453 White Plains Rd, Ste 203, Eastchester. $15. 914.793.2600. TheTemperanceCenter.com. Yoga Free Play – 7-8:30pm. Experience an evening of safety and support exploring yoga, dance, physical expression and freedom accompanied by world music. Rivertown Center for Yoga, 343 Broadway, Dobbs Ferry. $25. Info: Beth Bierko; 914.384.9983. Register: RivertownYoga.com. Osteoporosis Awareness Group Meeting – 7-9pm. Physical therapy management of osteoporosis including pilates. Free. Burke Rehabilitation Hospital Bldg #4, 785 Mamaroneck Ave, White Plains. Susan: 914.260.9339. Men’s Group – 7:30-9:30pm. Gather with other holistically minded men to focus on personal development and methods for shaping a healthier and more balanced approach to living, particularly in relationship to others. $200/series of 9 or $30/ea. Transcendence at SunRaven, Bedford. RSVP: 914.218.3113 or TranscendenceAtSunRaven.com. Weight Loss thru Body Cleanse – 7pm. Free orientation to find out how to lose weight quickly and safely and how to keep it off. Results are guaranteed. Infinite Possibilities Inc, 1132 Main St, Peekskill. RSVP: 914.788.9355. Sprouting Possibilities: Weight Loss for Young Adults 10-17yrs – 7pm. Free orientation for young adults to learn the benefits of how and what to eat and why. Infinite Possibilities Inc, 1132 Main St, Peekskill. Parking in rear. Register in advance: 914.788.9355. Infinitely Young – 7pm. Free orientation on body cleanse for those over 70. Lose weight and start rejuvenating internal organs; watch the aging process start to reverse itself in the first 10 days. Infinite Possibilities Inc, 1132 Main St, Peekskill. Parking in rear. Register in advance: 914.788.9355. 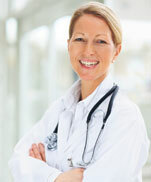 Advanced Practitioner Program Integrative Medicine Round Table Study Group –12:30- 2pm. Holistic health practitioners gather to discuss individual client challenges and share perspectives on approaches to healing. Led by Dr Michael Finkelstein. Includes healthy, light lunch. $200/series of 9 or $40ea.Transcendence at SunRaven, Bedford. RSVP: 914.218.3113. TranscendenceAtSunRaven.com. Mindfulness Based Stress Reduction Course – 9:15-11:30am. Feb 6-Mar 23. Discover practical skills for coping with stress and uncertainty, increased clarity and creative thinking, greater energy/well being, and the healing power of meditative practices. Westchester Yoga Arts, New Rochelle. Info: 914.632.1101. WestchesterYogaArts.com. National Wear Red Day for Women – Participants wear red and donate $5 in support of all women who have been touched by heart disease or stroke. Join the Go Red for Women movement and receive a red dress pin. GoRedForWomen.org. Women’s Wisdom Group –10:30am-12pm. Join a community of progressive women who share and support one another while drawing inspiration from Mark Nepo’s seminal work, The Book of Awakening. $30/session. 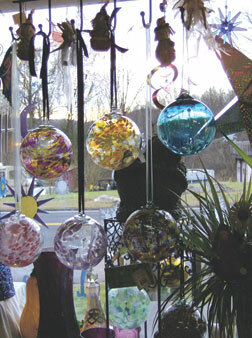 Transcendence at SunRaven, 501 Guard Hill Rd, Bedford. RSVP: 914.218.3113. TranscendenceAtSunRaven.com. Law Of Attraction Workshop – 10am-12pm w/Katie Ciriello. $35. Synchronicity, 1511 Rte 22, Brewster. RSVP: 845.363.1765.SynchronicityNY.com. Ayurveda 101 – 11:30am-1pm. Explore the sister science to yoga, including the 5 Elements, the 3 Doshas, and the causes of disease. Learn the benefits of eating for one’s dosha and begin and end with pranayama & meditation. Quest Yoga Arts, 11-13 E Main St, Mt Kisco. $25/advanced or $30. QuestYogaArts.com. Searching for Knowledge & Faith in the Dark – 12:30-2pm. An open-ended Socratic dialogue that invites and challenges the beliefs and expectations of all concerned in a safe and welcoming environment. $20. Inner Balance Studio, 1072 Rte 311, Patterson. 845.878.7800. InnerBalanceStudio.org. Finding And Feeding Winter Birds – 2pm. Winter walk to learn what birds wintering in our area like to eat and where they find shelter. The walk includes a visit to the Bird of Prey exhibit and busy bird feeders. Included with Museum admission; free for members. Greenburgh Nature Center, 99 Dromore Rd. Scarsdale. Info: 914.723.3470; greenburghnaturecenter.org. Let There Be Light Workshop – 2-5pm. Explore what it is to open to the light through chanting, movement, texts and inquiry. $45/advanced registration. Rivertown Center for Yoga, 343 Broadway, Dobbs Ferry. Info: Beth Bierko, 914.384.9983. RivertownYoga.com. Restorative Workshop – 4-6pm. This relaxing yet powerful practice that everyone can benefit from releases deeply held tensions, calms the nervous system, strengthens the immune system, and increases self awareness. $30. Quest Yoga Arts, 11-13 E Main St, Mt. Kisco. Preregister: QuestYogaArts.com. Meditation – 5-6pm. Also 2/23. This class is inspired by ISHTA Yoga. Pre and post meditative asanas are used to prepare and restore the body, while the ancient tools of pranayama, visualization, and mantra are used to still the mind. Quest Yoga Arts, 11-13 E Main St, Mt Kisco. $15/drop-in. QuestYogaArts.com. Ayurvedic Yoga Mix – 9-10:15am. This moderately paced class gives a deeper understanding of one’s body type. $108/member, $120 non-member. $20 one time audit. Wainwright House, Rye. 914.967.6080. Monthly Sounding & Singing Circle – 7-8:30pm. An evening of coming together to sing, be in community, free the voice, and offer healing. No professional or singing experience needed. Rivertown Center for Yoga, 343 Broadway, Dobbs Ferry. Donation. Info: Beth Bierko, 914.384.9983. RivertownYoga.com. Winter Trees at Sheldrake River Trail – 9:30-11am. Winter is a great time to learn how to identify trees by looking at buds, bark and branches. Explore the magnificent trees on this beautiful trail. Sheldrake Environmental Center, 685 Weaver St. Larchmont. Free/members; non-members/$10. Info/RSVP: 914.834.1443.sheldrakecenter.org. The Putnam Chapter of Over 40 Females – 6-8pm. A live and online nationwide networking company hosts a professional women’s business networking event at Char Steakhouse, Mahopac with guest speaker FelyCieza from Strategies for Wealth. Free/members or $25. RSVP: Over40Females.com. Thought’s Leading Edge Therapy Group – 7:30-9pm. Open house meeting to learn about the masterful techniques of EFT, NLP & energy healing with Elizabeth Pasquale. Be guided to a more full union of one’s best self. $50. Well on the Way, LLC, 222 Westchester Ave, White Plains. 607.351.7024. Bi Monthly Adult Meditation Group – 10-11am w/Merrill Black, Reiki Master. Unique theme, guided meditation, group discussion. The Temperance Center, 453 White Plains Rd, Ste 203, Eastchester. $15. 914.793.2600. TheTemperanceCenter.com. Garden Talk: Composting – 7pm. Dr Susan Rubin, Food Activist/Environmental Educator, speaking about composting. Sponsored by the Garden Club of Yorktown. Free. The John C Hart Memorial Library, 1130 Main St, Shrub Oak. 914.245.5262 x227. YorktownLibrary.org. Thought’s Leading Edge Therapy Group – 10:30am-12pm. See Feb 11 for details. $50. Well on the Way, LLC, 191 Main St, Ossining. Info: 607.351.7024. Fun and Fabulous Tarot – 7-9pm w/Beth Prins Leas. Explore this self-help tool during a fun evening designed for everyone. All attendees receive reading. $40/members or $45. Wainwright House, Rye. 914.967.6080; wainwright.org. 77 Questions for Skillful Living Study Group – 7:30-9:30pm. A unique gathering of individuals interested in a more in-depth and practical exploration of the concepts within Michael’s book: 77 Questions for Skillful Living. $200/series of 9 or $30/ea. Transcendence at SunRaven, Bedford. RSVP: 914.218.3113. TrancendenceAtSunRaven.com. Mom’s Town: Because it Really Does Take a Village to Raise a Child! – Every other Fridays beginning 2/14. Get together with other moms over coffee and discus of topics facilitated by a Child Psychologist. Learn how to manage being a mom in a stressful world. Dr. Kristy M. Vanacore’s Integrative Psychological Center, 334 Underhill Ave, 3C, Yorktown Heights. Info/RSVP: 914.497.8006. Valentines Day with the Angels Workshop – 7-9pm w/Adam Bernstein. $35. Synchronicity, 1511 Rte 22, Brewster. RSVP: 845.363.1765. SynchronicityNY.com. Save a Heart Buy Some Art Event – 7-10pm. An evening of champagne, dessert, music, and beautiful works of art from local artist. Door prizes. Tickets with $10 donation. 4338 Albany Post Rd. Hyde Park. Info: Tony B Production 845.625.3558. Reiki Healing Circle – 9-11am w/Marcus Feighery, Reiki Master. $15. Synchronicity, 1511 Rte 22, Brewster. RSVP: 845.363.1765. SynchronicityNY.com. Monthly Teen Guided Mediation Group – 11am-12pm w/Merrill Black, Reiki Master. Unique themes for ages 13-17yrs.The Temperance Center, 453 White Plains Rd, Ste 203, Eastchester. $15. 914.793.2600. Art Therapy on Hudson: Art Journaling Workshops – 1:30-3pm. Color, play, explore and write about that favorite color. $30/includes supplies. Register: 914.584.1820. ArtXOnHudson.com. Weight Loss thru Body Cleanse – 6pm. Free orientation to find out how to lose weight quickly and safely and how to keep it off. Results are guaranteed. Infinite Possibilities Inc, 1132 Main St, Peekskill. RSVP: 914.788.9355. Infinitely Young – 6pm. Free orientation on body cleanse for those over 70. Lose weight and start rejuvenating internal organs; watch the aging process start to reverse itself in the first 10 days. Infinite Possibilities Inc, 1132 Main St, Peekskill. Parking in rear. Register in advance: 914.788.9355. Sprouting Possibilities: Weight Loss for Young Adults 10-17yrs – 6pm. Free orientation for young adults to learn the benefits of how and what to eat and why. Infinite Possibilities Inc, 1132 Main St, Peekskill. Parking in rear. Register in advance: 914.788.9355. THE BOXCAR LILIES at The Blooming Seed Coffee House – 7pm. Trio of musicians and singer/songwriters bring blue grass, folk and gospel music to new heights. $12 at the door, cover includes locally roasted coffee courtesy Coffee Labs Roasters. Dessert cash bar by Home Sweet Home Bakery. 760 Route Six Mahopac (within Temple Beth Shalom). Partner Yoga – 1-3:30pm. Come with a partner or solo and explore the depth of experiencing poses in pairs. $50/per person. Registration required. Rivertown Center for Yoga, 343 Broadway, Dobbs Ferry. Info: Beth Bierko, 914.384.9983. RivertownYoga.com. Maple Sugaring At Home – 2pm. Learn the simple steps of how to make maple syrup. Dress for outdoors. Members $5, non-members $8. Greenburgh Nature Center, 99 Dromore Rd. Scarsdale. Info: 914.723.3470; greenburghnaturecenter.org. Couples Yoga: A Fine Balance of Give & Take – 2:30-5pm w/Athina Pride. A wonderful way to connect. Couples pricing: $360/member or $400. $100/one-time audit. Wainwright House, Rye. 914.967.6080; wainwright.org. Bi Monthly Adult Meditation Group – 7-8pm w/Merrill Black, Reiki Master. Unique theme, guided meditation, group discussion. The Temperance Center, 453 White Plains Rd, Ste 203, Eastchester. $15.914.793.2600. TheTemperanceCenter.com. Community Reiki Circle – 7-8:30pm. Open to those trained in Reiki who wish to practice and those not trained who wish to receive healing. Rivertown Center for Yoga, 343 Broadway, Dobbs Ferry. Info: Beth Bierko, 914.384.9983. RivertownYoga.com. Westchester Holistic Network Meeting – 8-10am. It’s not just for practitioners. Enjoy friendly people, healthy breakfast, compelling speakers. This month, Jenni Stone presents on Astrology. Good Counsel Campus, 52 North Broadway, White Plains. $15/members or $20. 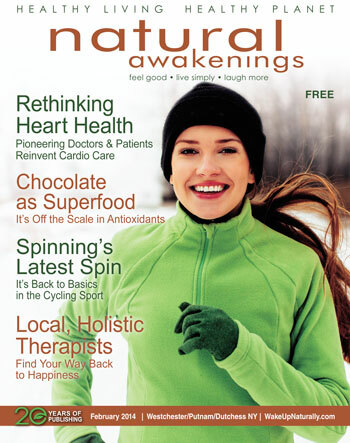 WestchesterHolisticNetwork.org. Professional Women of Putnam – 6-8pm. Celebrate Your Heart event benefits the American Heart Association. The Winery at St. George, 1715 E Main St, Mohegan Lake. $15/includes appetizers. Cash Bar. More info: ProfessionalWomenOfPutnam.com. Farmer Chef Alliance, Potluck and Presentation – 6:30-9pm. Snow date 2/19. Presenter: Peter Schmidt, Organic Farmer and Co-Founder Compostwerks. Bring a dish to share. Sponsored by Slow Food Metro North. Muscoot Farm, 51 Rt. 100, Katonah. slowfoodmetronorth.com. Bi Monthly Adult Meditation Group – 7-8pm w/Merrill Black, Reiki Master. Unique theme, guided meditation, group discussion. The Temperance Center, 453 White Plains Rd, Ste 203, Eastchester. $15.914.793.2600.TheTemperanceCenter.com. Thought’s Leading Edge Therapy Group – 7:30-9pm. See Feb 11 for details. $50. Well on the Way, LLC, 222 Westchester Ave, White Plains. Info: 607.351.7024. Master Reiki Class – 9am-5pm. Feb 22-Feb 23 w/Reiki Master Marcus Feighery. $675/both classes. Synchronicity, 1511 Rte 22, Brewster. RSVP: 845.363.1765. SynchronicityNY.com. Reiki I Class – 1pm. Learn this ancient art of hands on healing in a two day course that also incorporates everything needed to know about the chakra system. Walk away as a certified Reiki Practitioner with the ability to go anywhere and work in the field of healing. Shima: 917.279.9577. The Fairy Tale Marionettes – 1-4pm. Imagination and life lessons take breath through this creative, literature-based theater program. Course I: For girls only, grades 2-5. Wainwright House, Rye. 914.967.6080. Wildlife In Winter – 2pm. Naturalist shows off favorite animals in this entertaining and informative program. Visitors hear, see, and touch many fascinating furry, feathered, and scaly friends. Best for ages 5 and over. Members $5, Non-Members $8. Greenburgh Nature Center, 99 Dromore Rd. Scarsdale. Info: 914.723.3470; greenburghnaturecenter.org. Reiki II Class – 1pm. See Feb 22 listing for details. Anyone looking to be attuned to Reiki Master can also call Universal Healing Arts Connection. Shima: 917.279.9577. Pineal Gland Awakening & Activation – 1-3pm. Create a magical, bliss-filled year for the self and loved ones with the creator of RICH Healing. $33. Refreshments. Info & RSVP: 914.575.8170. NewAgeBeginnings.com. Aging Gracefully: Wisdom Through the Ages with Tao Porchon-Lynch – 2-4:30pm. Tao leads students through a deeply absorbing meditation, inspiring deep compassion and inner peace. $50 early registration. 49 Lawton St, 2nd Floor, New Rochelle. 914.632.1101; westchesteryogaarts.com. Ayurvedic Yoga Mix – 9-10:15 am. This moderately paced class gives a deeper understanding of one’s body type. $108/member, $120/non-member. $20 one time audit. Wainwright House, Rye. 914.967.6080; wainwright.org. Thought’s Leading Edge Therapy Group – 7:30-9pm. See Feb 11 for details. Well on the Way, LLC, 222 Westchester Ave, White Plains. $50. 607.351.7024. The Science Of Nutrition Made Simple – 7-8:30pm. In this 3-part course, learn to rewire the brain to gain control of thoughts and feelings about food and get the body and a life to love. Wainwright House, Rye. 914.967.6080; wainwright.org. Wainwright Monthly Spiritual Film Series: Yoga Woman – 7-9pm. From the busy streets of Manhattan to the dusty slums of Kenya and the golden beaches of Australia, this documentary uncovers a global phenomenon that has changed the face of yoga forever. $10 members/$15 non-members. Wainwright House, Rye. Info: 914.967.6080. Go Red For Women Luncheon – 9am-2pm. American Idol participant Kimberley Locke keynotes the 6th annual Go Red For Women luncheon. Program also includes educational breakout sessions, interactive heart check-up, and a unique auction featuring sophisticated handbags, wallets and accessories. Jamie Hritz, 945.905.2134. Heart.org/dutchessulstergoredluncheon. Develop Innate Psychic Ability in 1 Day – 10am-4pm. Learn the science behind the sixth sense and practice ESP. Everyone is psychic; participants are invited to experience this. Info: 914.672.9741. thescienceofmetaphysics.com. Thought’s Leading Edge Therapy Group – 7:30-9pm. Also Tue Mar 18. Open house meeting to learn about the masterful techniques of EFT, NLP & energy healing with Elizabeth Pasquale. Be guided to a more full union of one’s best self. $50. Well on the Way, LLC, 222 Westchester Ave, White Plains. 607.351.7024. Mindfulness at Work, with Sharon Salzberg and Janice Marturano – 3/7-3/9. Two perspectives on cultivating a mindful and compassionate experience of work. Garrison Institute. Info/register: 845.424.4800; garrisoninstitute.org. Natural Awakenings’ guide to buying fresh food straight from the farmer at their farm stands. When it comes to healthy eating, summer can’t be beat for ripe fruit, juicy berries, and fresh vegetables. Fortunately, Westchester and Putman Counties are full of farms overflowing with delicious and nutritious food, and eating local is as easy as visiting their farm stands and markets. Read on for details about where, when and what to buy this season. U-Pick organic raspberries, fancy summer squash in many varieties, and specialty radishes including Pink Beauty and French Breakfast; Garlic Scapes, a perennial delicacy, and Swiss Chard for the cutting. Vegetables and leafy greens like kale, collards and chard, garlic, and cut flowers. Not certified organic, but everything is organically grown. Owned and operated by: Linsay Cochran. Cascade is a farm stand, CSA and Farm School with sustainable practices. Features baby goats, lambs, chicken, piglets, vegetables, herbs, honey, maple syrup, and eggs. Features organic produce, farm fresh eggs, cut flowers, farm animals, and more. The former location of Outhouse Orchards, this new farm is a NOFA member that’s started the process of becoming certified organic. Vegetables and vegetable plants, local honey, fruits, maple syrup, and Green Mountain Coffee are available. Contact/Info: Robert Covino, HarvestMoonFarmandOrchard.com; 914.485.1210. The lambs, goats, and cattle continually graze on more than 100 acres of pasture, and the chickens, ducks, geese, and turkeys are also free-range. Pigs, rabbits, Guinea fowl, pheasants, and quail may also be spotted at Hemlock Hill. The animals are never given hormones or antibiotics and, when they’re not grazing outside, they’re eating all natural grains. All produce is grown on the farm without the use of pesticides, synthesized fertilizers or herbicides. 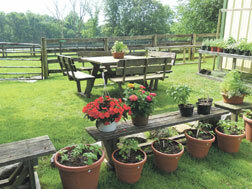 Features 20 acres of organic crops, including many vegetables, watermelon and herbs. Corn is picked daily—sometime twice—for the sweetest, freshest corn. Certified Organic Grower and CSA producing flowers, herbs, and vegetables for wholesale, retail and custom orders. Delivers on Wednesdays to Westchester and Fairfield Counties. This new farm grows vegetables without the use of synthetic herbicides or pesticides, and uses cover cropping, crop rotation and compost to build soil life. They offer fresh vegetables, herbs, cut flowers and eggs. Farm Stand: open June to December on Tuesdays from 9am to 12pm, Thursdays from 3 to 6pm and Saturdays from 9am to 1pm; look for signs on where to park. The farm stand is open three days a week, but Stone Barns Center is open to the public Wednesday through Sunday from 10am to 5pm, year-round. Salad mixes, vegetables, strawberries, herbs, lamb and pork, whole chickens, turkey cuts, and eggs are available for purchase. The county’s oldest working farm features 200 acres of apple orchards, pumpkin fields and vegetable crops. Some organic produce is available. Organic vegetables like kale, peas, Swiss chard, and squash are available now. Heirloom tomatoes such as Brandywine, eggplant and peppers will follow. Also available are annuals, perennials, bulbs, grasses, herbs, roses, flowering shrubs, and fruit trees, as well as local honey, maple syrup, preserves, pickles, chutneys and biscotti. Visitors are welcome to walk through the home gardens for inspiration and methods for outwitting deer. Farm Stand: Tuesday through Sunday from 10am to 6pm. Grass fed beef is available, and a huge selection of vegetables, fruits, flowers, eggs, and maple syrup. Coming soon: chicken meat. Not all products are organic certified, but everything is pesticide-free, naturally grown, grass fed/pastured, and either raised, grown or made by them. A cancer diagnosis is scary, life changing and…a reason to grab at least 10 friends and family members and stay up all night celebrating? The American Cancer Society’s Relay for Life invites participants to do just that at the annual overnight event that honors and celebrates cancer survivors. More than 4,800 relays will take place across America this year, 265 of them in communities throughout New York and New Jersey. 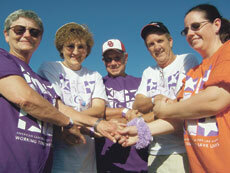 The event opens as cancer survivors of all ages walk, run, or move around a track for the first lap. This emotional display is followed by a festive atmosphere that develops around the track as teams of 10 to 15 people spend the night raising awareness and money to support cancer research, education, advocacy and services. A highlight of the evening is the candlelight vigil, held at nightfall to honor cancer survivors and remember those lost to cancer. The candles line the track and burn throughout the night to remind to participants about the importance of their involvement. Participants are also encouraged to fight back by learning about their own risk of various cancers based on their age, family history and race. At some locations this year, participants can enroll in a study to create better understanding about what causes cancer and how to prevent it. Mahopac – June 5 to June 6, 7am-7am. Mahopac High School, Baldwin Place Road. Luminary Ceremony at 9:30pm. June 6: Sunrise Mass Closing Ceremony. Mount Vernon – Friday, June 11, 3pm to 8pm Saturday. Hutchinson Field. Info: dstern39@yahoo.com. Ossining – June 5, 7pm-7am. Anne M. Dorner Middle School. Info: hilary.lucadamo@cancer.org. Patterson – June 12, 12pm- midnight. Patterson Fire House. Opening Ceremony at noon. Luminary Ceremony at 9:30pm. Closing Ceremony at midnight. Peekskill – June 5, 12pm-12am. Info: Jacqueline Smith jacqueline.smith@cancer.org. White Plains – June 18, 7pm-7am. Info: nicole.gauthier@cancer.org. Yonkers – June 4, 7pm-7am. Info: jacqueline.smith@cancer.org. Yorktown – June 11, 5pm-7am. Info: monica.garrigan@cancer.org. The Art of Healing has opened its doors at 1 Front Street in Patterson, NY. Holistic Health Practitioner Bill Bubenicek created the center in response to his clients’ frustrations with traditional medical practices. Bill works from the belief that, given the proper circumstances, the body innately heals itself. The modalities offered at The Art of Healing involve both cutting edge technology and ancient philosophies of healing. Services currently available include massage therapy, acupuncture, Active Release Techniques, nutritional counseling, weight loss (in a program called Take Shape for Life), Bio-Tracker homeopathy, detoxification footbaths, cold laser therapy, pelvic stabilizers (custom made orthotics) and customized cervical pillows. Practitioners at The Art of Healing help to create a road map through which the body will journey to optimal health. Along the way, clients learn how to maintain their success by creating habits of health that will support their goals and desires. Bill, a Holistic Health Practitioner and graduate of the Institute for Integrative Nutrition, has studied all major dietary theories. He is certified by The American Association of Drugless Practitioners and has been trained and certified as a cold laser technician. 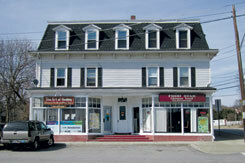 The Art of Healing is located at 1 Front Street in Patterson, NY. Hours are from 10 a.m. to 5 p.m. Monday through Friday, and other times by appointment.